Product prices and availability are accurate as of 2019-04-19 20:08:44 UTC and are subject to change. Any price and availability information displayed on http://www.amazon.com/ at the time of purchase will apply to the purchase of this product. Of all the things that separate humans from animals-language, the arts, thumbs-one of the most discerning is that we must top our vegetation with a hearty dose of dressing. Italian, French, Greek, Southwest ranch-almost every end of the earth has come up with a unique variety. And while all provide rich tastes, just as many can practically ruin a healthy salad by dropping a big, fat calorie bomb on top. Thankfully there are still options that can provide tons of flavor while also cutting down on unnecessary additives. 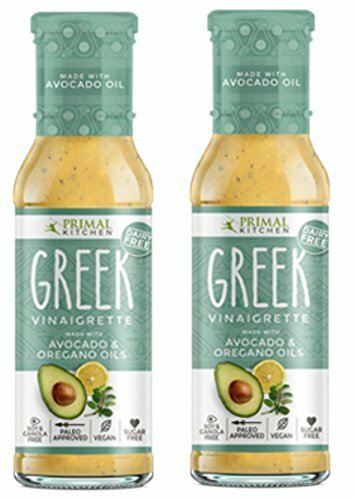 Some, like Primal Kitchen Greek Vinaigrette with Avocado Oil, even go a step farther in providing an additional health boost by using all-natural ingredients that complement the good-for-you vegetables already on the plate. Made with vinegar, avocado oil, sea salt, organic apple cider vinegar, black pepper, oregano, coriander, and oil of oregano, Primal Kitchen's Greek vinaigrette will give your salad just the pop it needs to upgrade it from a sad side to a delicious main course. A HEALTHY DRESSING: Conventional dressings cause weight gain & spiked blood sugar, ingredients turn into genetically modified mutated oils full of trans fats & sugar. Our dressings are made with avocado oil, 100% refined sugar & trans fat free. 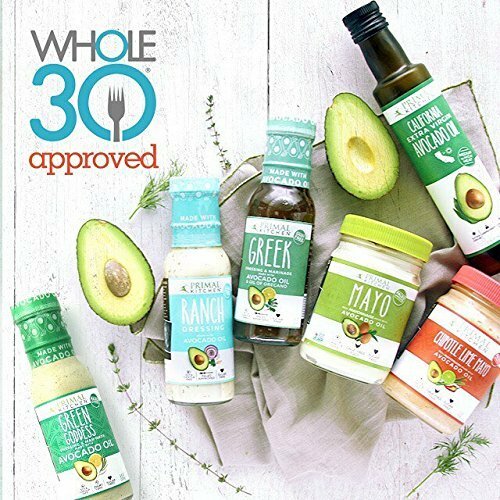 NATURAL INGREDIENTS + HEALTH BENEFITS: Avocado Oil = Increase nutrition absorption + Antioxidants that help protect against disease and accelerated aging + Acts as an anti-inflammatory + Great source of Vitamin E + Beneficial omega-9 fatty acids. 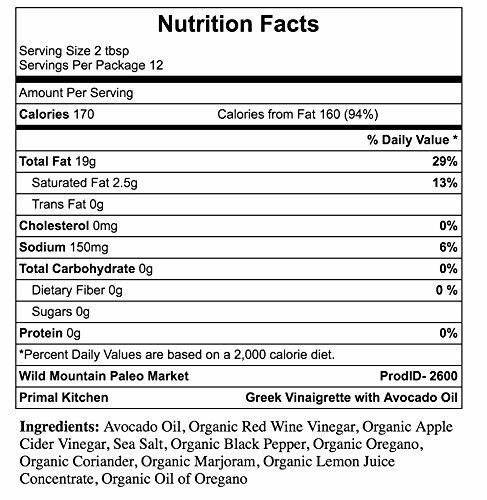 PRIMAL ROOTS: pure, nutritious, real food ingredients with no artificial colors, preservatives, or ingredients. Non-GMO Project Verified. Paleo approved. Kosher. Certified gluten free. FREE OF: Sugar, Gluten, Dairy, Soy, Canola, Soybean or industrialized seeds, artificial preservatives, fillers and trans fats. Cage-free organic eggs and vinegar from non-GMO beets. 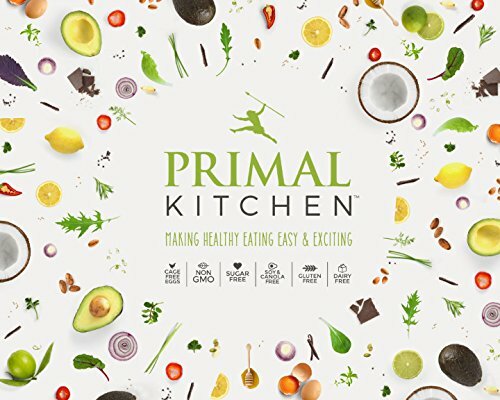 WHY PRIMAL KITCHEN: Our philosophy is every bite of food you eat should be delicious & healthful. Eating organic foods can become boring without sauces, which many contain harmful fats, sugars & artificial ingredients for taste. This is the solution!